Scott’s announcement came hours after federal health officials said they plan to approve the state’s longstanding request to privatize its Medicaid program statewide if they agree to beef up transparency and accountability measures. He said that decision signaled that feds were willing to work with the state to give them the flexibility they need. Okay, now I see the “transparency” in this particular move. It’s startling to see Gov. 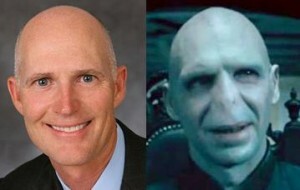 Rick Scott transform from being the University of Florida’s tormentor to its new best friend. Senate Minority Leader Chris Smith, D-Fort Lauderdale, said the economy is moving forward, but Scott is “back-pedaling” with his eyes on the 2014 election because his reform efforts in education, pensions and insurance have not been popular. “When he’s now throwing divots and dollars at education, after he came in and slashed education, he’s finally admitting that he was wrong to try to starve education. House Minority Leader Perry Thurston, D-Fort Lauderdale, called Scott’s proposal “woefully lacking” because of the requirement for state employees to contribute 3 percent of their pay into the Florida Retirement System and the $1.3 billion in cuts to education in 2011. In the end though, even with these reversals, Scott will have to deal with the fact that his moves to slash taxes had zero impact on Florida’s unemployment rate. 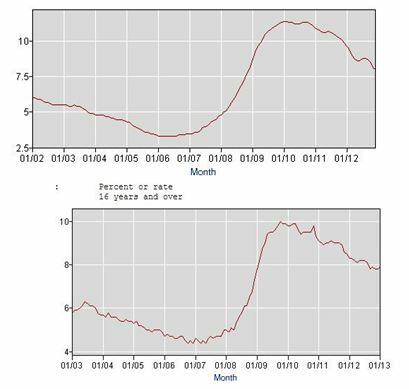 The graphs below, from the Bureau of Labor Statistics, show Florida’s unemployment rate on the top and the overall US unemployment rate on the bottom. Florida fared exactly as the rest of the US did in its recovery from the economic meltdown of 2008 despite Scott’s claims that his plan would lead to a faster recovery of jobs in Florida. It will be interesting to see how Scott tries to spin these lackluster results on job creation. I’d put a big wager on Scott saying it’s all Obama’s fault. The governor of the state in which I reside (I refuse to claim anything remotely resembling ‘ownership’) is a corrupt pig. There are far too many folks now in the D party who would have been considered moderate to conservative Rs 40 years ago. @dakine01: Yeah, it’s really scary how “liberal” most of Nixon’s policies would be considered today when described without his name attached. And I agree that Crist is only better than Scott by an eyelash, but anything resembling progress here is exceptionally difficult, as you well know. Wake me up when Carl Hiaasen writes a book about this. Until then, it’s just too sad to think about. Which photo is “before” and which is “after”? As for the GOP moving further and further to the right, it’s not like we weren’t warned. After, all Jonah “doughy pantload” Goldberg “wrote” lots and lots of pages to claim that Hitler was far to the left of the GOP. Says more about the GOP than Hitler, however. We MUST rid ourselves of all the ALEC Gov’s and Congress critters. @Snarki, child of Loki: As I was telling someone on Twitter last night, Rick Scott = Lex Luthor and Hank Paulson(remember him?!?) = Skeletor. White House Capitulates to Benghazi Truthers Rather Than Coming Clean on Targeted... Shorter Neal Katyal: Please Appoint Me Judge!